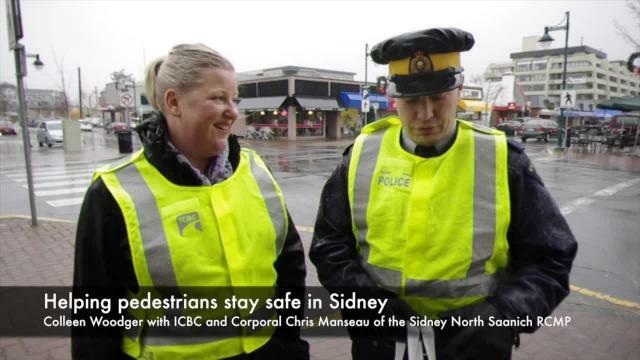 RCMP officers and ICBC Road Safety Co-ordinator Colleen Woodger hit the rainy streets of Sidney this week, handing out reflectors to pedestrians and reminding people of shorter days and worsening weather and visibility at this time of year. The effort is to raise people’s awareness around pedestrian safety says Corporal Chris Manseau, who along with Constable Meighan de Pass, the Sidney North Saanich RCMP’s community policing officer, joined Woodger in offering people the reflectors in downtown Sidney Tuesday. Sidney has a history in trying to keep pedestrians safe. In addition to the long-standing ICBC program of giving out reflectors, former Sidney Town Councillor Kenny Podmore took it a step further a few years ago and had reflective arm bands made up. They were given out for free, on a first-come, first-served basis. It’s all about keeping people safe, Woodger said, noting that it’s great when municipalities get on board with the message. As well as giving out the reflectors, the officers took the opportunity to remind pedestrians about crossing in marked crosswalks, making eye contact with drivers to ensure it’s safe to go, as well as other safety tips. With fewer hours of daylight during the fall and winter months, as well as inclement weather, police and ICBC remind both pedestrians to and drivers to be aware of each other and to ensure they are not distracted while they are crossing the road – or while driving.